The perfect pillow can often mean the difference between a restful night’s sleep and one in which the sleeper tosses, turns and eventually wakes up with a stiff, painful neck. Though we may agonize over selecting the perfect mattress, it is the humble pillow that is responsible for aligning the delicate and complex bones through the head and upper back. Because a pillow bears much of the responsibility for our comfort and health during the hours we sleep, its is important that we approach our buying decision armed the proper information because there is now a wide variety of pillow shapes, materials and densities, all of which serve difference purposes and cater to difference preferences. When shopping for a new pillow, you may not realize how many factors there are in such a decision. Consider these six factors and if you are in a store showroom, don’t be afraid to try out a pillow before buying, but be aware that some pillows, such as memory foam pillows, will alter their shape subtly through the night as your body heat changes their consistency, so your store experience may not replicate your actual use. If you usually wear a sleeping mask then I would suggest bringing it with you when you try the new pillows. No matter which pillow you select, don’t forget that all pillows have a limited life span which varies based on the material. Some should be replaced starting at six months while other pillows can last between twelve and eighteen months before they have reached the end of their useful life spans. For those with allergies, a pillow can be a common allergic vector since it is both close to our nose and mouth and can trap dust mites, dead skin cells and other common allergens. In order to avoid triggering your allergies on a nightly basis, select a pillow that is hypoallergenic. Latex pillows will resist fungal growth and infestation by mites and bed bugs but some sleepers have to avoid them due to latex allergies. Be on the lookout for specialty coverings and coatings that can block pests and allergens and remember that wool/cotton pillows are hypoallergenic themselves but can trap foreign particles if not encased properly. Synthetic pillow fills are generally superior for those with allergies. The position you sleep in will determine how firm your pillow should be as well as its general size. This is a matter of preference and there is no single, agreed-upon correct sleeping position. Continue reading for a more detailed analysis of how to select a pillow based on your personal preference of sleeping position. A sleeper’s preference for firmness often relates to the preference for sleeping position, but not always. Once again, it is largely a matter of preference, provided that the head and neck are sufficiently supported. If you prefer a firm pillow, look for tightly packed cool/cotton or a memory foam or latex pillow that is is rated for firmness. To test the pillow when shopping, place it on a hard surface and compress it with your hand to half of its original size. Compare the pressure needed between different pillows and you have the relative firmness. How long it takes to resume its original shape will be its resilience. Rather than the type of pillow, this will determine the recommended number of pillows and their size you should look for when shopping. For a twin bed, a single standard size pillow is common but for a double or a queen, the recommendation is for two standard or two queen-size pillows. For a king-size bed, you should look for three standard size or queen-size pillows or two king-size pillows. Construction quality can be difficult to judge, but when in the store you should pay close attention to the seams to make sure that they are sewn straight and neat and that the filling, if there is any, is well-distributed. Check for a usable zipper if it is a filled pillow and look for piping along the edges that can help reduce wear. Also check for the tightness of the weave to help block out dust and mites. Consider the fact that you will need to replace whichever pillow you purchase in a number of months, so buy the best pillow you can afford for your health and preference without overpaying. Prices can vary widely, so it is a good idea to shop around and balance price with quality. Sleeping style will determine the firmness and material of your pillow. Again, there is no single correct sleeping style, but your sleeping style preferences are an important factor in any selection process. If you are a back sleeper, it is important to select a thin pillow to prevent your head from being pitched forward too much. The pillow should support the neck from behind but raise the head only slightly from the bed. Choose a pillow that is too firm and you may experience both neck pain and a snoring problem. For those who prefer sleeping on their sides, a thicker, firmer pillow will provide better support to the head and neck as it suspends it in a more natural position over the shoulder. Sleeping on the stomach requires an even thinner pillow than those who prefer the back and in some cases, stomach sleepers may be able to forego the pillow entirely, at least for their head. Try sleeping with a pillow under your stomach to achieve proper cervical alignment if you are a stomach sleeper. There is now a wide select of pillow materials on the market, each with its own list of pros and cons. Here are a few of the most common along with a few major points to consider on each. A bamboo pillow is not actually filled with bamboo but instead is covered with a woven bamboo fabric than is soft and breathable. 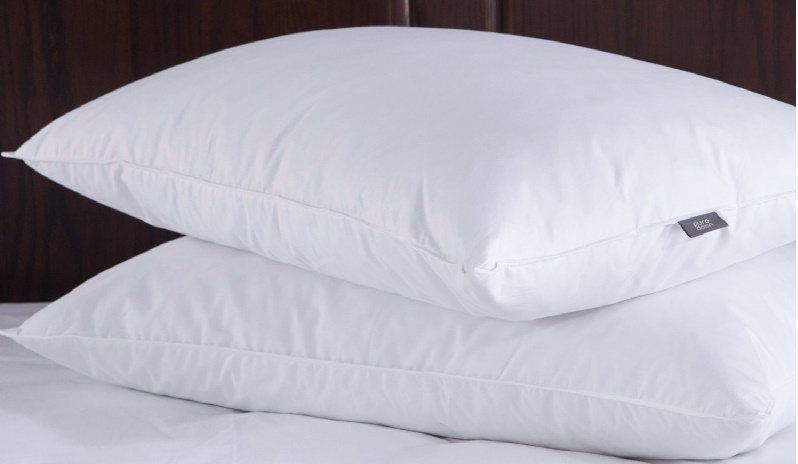 These pillows, relatively new on the market, are often filled with shredded memory foam that offers a balance between firmness and soft comfort. Form pillows can be formulated for varying densities. They can be solid or stuffed with foam chunks. The greater the density, the more support you will receive. Filled foam pillows can lose their shape however, especially when they are near the end of their life span. Latex pillows should be avoided by those with latex allergies, but for all others they offer protection against many of the standard allergy sources found in pillows. Like the foam pillows, latex pillows can be formulated for varying firmness densities. Latex pillows are often pre-shaped to a certain form to offer better support for the head and neck. Memory foam is renowned for its ability to provide superior support and comfort, but it also becomes more pliable when warmed by your body head. Memory foam pillows will try to return to their natural shape and this allows the pillows, especially if concave, to support the neck in a healthy, comfortable way. Also look for memory foam that contains ventilation holes for increased breathability. Some sleepers complain about a chemical smell that memory foam can emit at night. Wool and cotton can be adjusted for firmness by packing more or less fibers into the case, but these grow less firm as they age. Unless protected by a tightly woven covering, they can trap dust and dead skin inside as, can any stuffed pillow, but the traditional stuffed wool or cotton pillow is not a choice that should be ignored. For those who have latex allergies, a wool or cotton pillow can be the answer. Pillows filled with down and feather allow the sleeper to redistribute the filler to allow for different sleep preferences. In down and feather pillows, the feathers act like tiny springs while the down provides a comfortable layer of cushion. These pillows try to offer additional support for the neck. It is unclear if pillows marketed as such do have a significant impact, but memory foam and latex pillows will in general provide better neck support. Try these out on your own to see if you feel the difference. These pillows contain tiny beads that are intended to absorb and wick away sweat, thus keeping the sleeper’s head cool. For those of us who prefer sleeping on the cool side of the pillow, this type of pillow offers that experience throughout the night. These pillows, sometimes very similar, both have as their purpose to increase air flow and circulation by ensuring a proper position of the head and neck at all times. Several types of pillows are marketed for promoting oxygen flow and preventing snoring, and memory foam pillows are designed with this in mind. There is some evidence that this can not only help reduce snoring but also help improve health outcomes for those with diabetes. Buying a pillow is now a more complicated task than it used to be, thanks to advances in material and sleep science. Partly based on personal preference and in part based on health and cost factors, pillow shopping should be planned using a helpful guide. Now that you have read over a few of the factors to consider, you will be better armed to make an informed decision and ensure a good night’s rest.